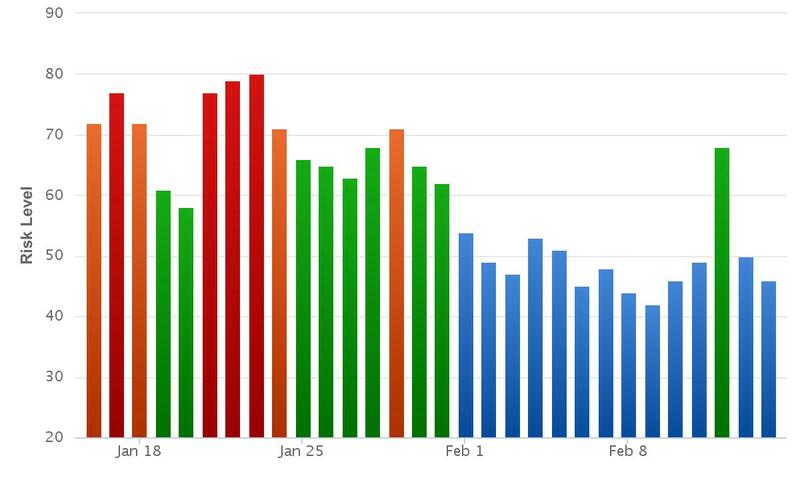 After a calm start to February with no real Google Updates or volatility in the Desktop SERPs (there was some testing specific to mobile SERPs), it looks like there were some minor algorithm changes this last weekend. Published: Feb 15, 2016. 08:10 +0100. While the latest volatility is reasonably minor, it is useful to provide a quick update as we have not posted one since we reported on the major SERP changes back in the middle of January. We are also waiting for the new real-time Penguin Algorithm to be released, which was indicated to be launched within weeks back on the 21st January. We do not believe the latest volatility is related to Penguin. Keeping an eye on the SERP trackers is extremely useful to help diagnose whether any changes in your rankings is due to something you did (i.e. changing website structure, adding new content, getting new links), or whether it is due to something Google did. Even if you don’t know what Google has done to cause your rankings to drop, it provides a prompt to revisit Google’s Guidelines (which have recently been updated) and check for both technical, and quality factors. We highly recommend reviewing old content, and tools such as Moz, or SEMrush can help point out technical matters that need fixing (you can even just subscribe for the odd month, rather than continuously). But just revisiting old content, and making it “better” can help as part of your wider SEO strategy. The Rank Risk Index shows a clear representation of what has happened this month so far. After the volatile January, February started off remarkably calm. We also believe that toward the end of January, some of the most draconian changes we saw in January were rolled back (based on keyword positions we are tracking ourselves). We suspect the quiet start to February was to enable testing to be carried out on the Mobile SERPs without confusing the results. That being said, we did notice some changes in keywords we track ourselves around the 3rd February, but this is not reflected by the Rank Risk Index. The Rank Risk Index chart below shows a definite spike on the 12th February. Rank Ranger Risk Index 12th February. © Rank Ranger. MozCast shows a similar spike on the 10th and 11th February, and also picks up on the tremors we felt on the 3rd February. MozCast Weather 10th and 11th February. © Moz. Is there any indication what the Google update is targeting? Unfortunately, we do not have much to say about the recent Google updates \ testing. They seem minor iterations of the core algorithm and not something in isolation we believe that you should be overly concerned about. It is possible that they are targeting content quality, but we cannot rule out specific tests in preparation of the new Real-Time Google Penguin algorithm, although this is just speculation. There is very little forum chatter about the recent update this last weekend, which seems to confirm that nothing major is happening. From looking at the rankings of our own targeted keywords, many of these updates over the past weeks seem to impact poor quality or over-optimized content. Just revisiting pages that have shown a drop and improving them has been beneficial for us. Remember, though, it can take some time for any changes you make to be reflected in Google.